I don’t think there is a nonprofit that hasn’t had to worry about budgeting for advertising. In this post you’ll find everything you need to know about the Google Grant Program for nonprofit organisations. 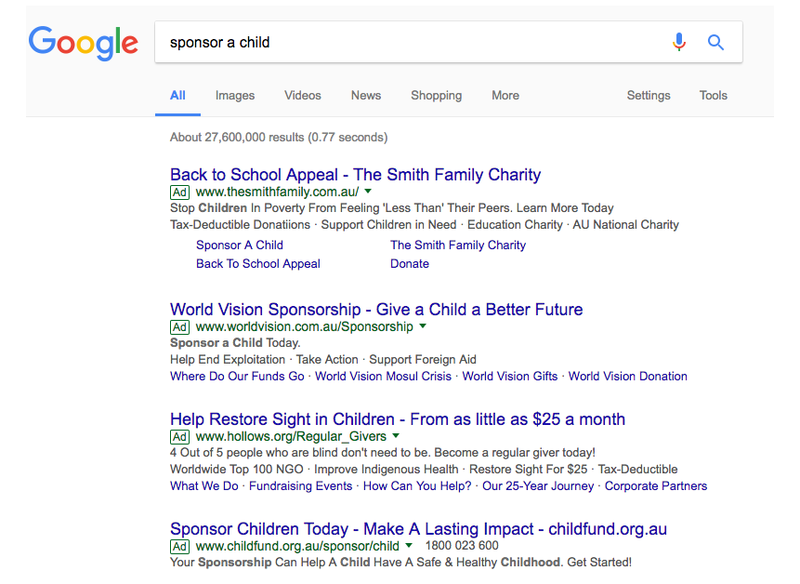 The Google Ad Grants Program gives nonprofits the chance to advertise on Google AdWords at no cost to the nonprofit. This program gives qualified organisations USD$10,000 per month in AdWords spend to be used to promote their missions and initiatives on Google.com. Google Ad Grants are a great way to gain some advertising funds to get your nonprofit’s name and the great things you do out into the community. Google AdWords is Google paid advertising product. Ads typically include four lines of text, including a headline that links to your website. You’ll use keywords to target your ads, selecting a set of words related to the services you’d like to advertise. Then, when people search on Google using the words or phrases you picked, your text ads can appear alongside or above the search results. Google Ad Grant is an AdWords account with a USD$10,000 cap. AdWords lets you create text-based ads and associate them with different keywords. You can create other types of campaigns and set the target based on other things like audience or device, but Ad Grants are set to target keywords only. When someone searches for a keyword you’ve chosen on Google, your ad could appear above or below the organic search results for that phrase. As you may know AdWords operates on a bidding system. The maximum bid you can place on any given keyword will be USD$2. So if the minimum bid is higher than that (usually due to its popularity), your ad won’t be shown for that particular keyword. But when the minimum bid is less than USD$2, your ads will appear below the paying ads that are included for any particular keyword phrase. The Nonprofit organisation must exist in one of the countries listed here. The Nonprofit ogranisation must also hold a current, valid charity status and acknowledge. Google Grants notes that organisations must be funds or institutions that have either been endorsed as such in Australia by the Commissioner of Taxation or “prescribed charitable institutions” in the Income Tax Assessment Regulations of 1997 that have Deductible Gift Recipient status to be chosen for the programme. You can apply for Google Grants by filling in the form here. Make sure you have all the required documents (DGR Status) ready before you start the process as you will need to attach the documents to the application. Feel free to contact us if you would like to learn more about the Google Grant program or need help to setup your account.